The Portioner’s house stood in what is now Beddington Park to the west of Church Road, east of Croydon Road and south of the new graveyard. The house took its name from the Portioner – a priest who was entitled to the tithes of the manor or sub-manor of Huscarl’s within Beddington parish. The last Portioner was appointed in the mid-sixteenth century and the Portionary tithes passed into the hands of the Carew family who were lords of all the Beddington manors. At some point the house became the rectory. In the late eighteenth century the rector successfully sued the trustees of the Carew estate for the tithes of the Portion but he lost control of the house which returned the Carews. They then let it to two successive tenants until it was demolished about 1843. 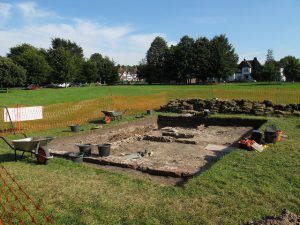 There is some evidence to suggest that there was a significant medieval house on the site but little is known about the building before the early nineteenth century. The excavation here proposed is a limited evaluation which aims to uncover parts of the foundations to throw light on its structural history. The full details of this excavation are contained in the following PDF files. Please click the links below to view.